When Thomas Phelan and Keith Young died within a day of each other last week, it was as a result of cancer, from which both had been suffering. But the underlying cause of the firefighters’ deaths was the event which they both witnessed up close 17 years earlier: the 11 September attack on New York. Phelan and Young’s names will not be added to the official tally of 2,977 people killed in the attacks, which also targeted the Pentagon and a plane that crashed in Shanksville, Pennsylvania. Their deaths were, however, a result of what happened at the World Trade Center that September morning. According to records maintained by the Uniformed Firefighters Association of Greater New York (UFANYC) union, theirs were the 172nd and 173rd deaths of firefighters to have occurred because of 9/11-related illnesses, and the sixth and seventh so far this year. Inevitability, sadly, their deaths will not be the last. About 400,000 people are believed to have been exposed to toxic contaminants, or suffered injury or trauma in lower Manhattan that day, according to the Center for Disease Control and Prevention (CDC). The president of the UFANYC told the BBC that roughly one in eight firefighters who were at Ground Zero have since come down with cancer. Thomas Phelan was not working for the New York City Fire Department (FDNY) on 9/11, but played a critical role that stood him in good stead for his later career. Soon after the attacks on the World Trade Center took place, all transport to and from Manhattan was shut down. Bridges, main roads and tunnels were closed, and people found themselves stranded on Manhattan, with no evacuation plan in place. What happened next was a mass evacuation by boat that was larger even than what happened in Dunkirk during World War Two. About 500,000 people are estimated to have been taken to safety by boat in only nine hours – the largest evacuation in New York City’s history. He stopped working for the Statue of Liberty ferry in May 2003 and joined the New York City Fire Department (FDNY), eventually making his way back on to the water as a pilot on board a firefighting boat. Phelan, who was 45, was diagnosed with lung cancer only two months ago, not long after running his best marathon time. 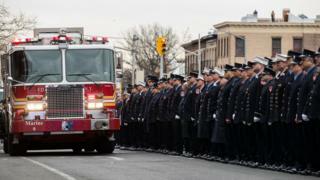 He died on Friday 16 March, and hundreds of firefighters lined the streets of the Brooklyn neighbourhood of Sunset Park for his funeral on Tuesday. Gerard Fitzgerald, the president of the firefighters’ union the UFANYC, said Phelan, a friend for more than 25 years, was “a very talented, very nice, good-hearted guy”. Among others to pay tribute was New York Mayor Bill de Blasio, who said Phelan’s “heroism saved hundreds of lives”. Keith Young joined the FDNY in 1998 and was stationed in Midwood, Brooklyn on the day of the attacks, when 343 firefighters were killed. He joined the rescue and recovery efforts at Ground Zero, which went on for nine months afterwards. While no emergency workers died during the recovery efforts, working in Ground Zero soon took its toll. The first 9/11-related death of a firefighter registered after the disaster is that of Gary Celentani, who took his own life 14 months after losing many of his close friends. Many others, like Young, were struck down with cancer attributed to the effects of being at the site. He first fell ill in December 2015, three years after his wife Beth died of breast cancer aged 47, and underwent surgery to remove a large tumour from his pelvis. After his treatment, he retired from duty, but died aged 53 on Saturday 17 March. While working for the FDNY, he became well-known for his skills in the kitchen, and received a degree in culinary studies. In 2003, he published a book, Cooking With The Firehouse Chef, and he went on to win two titles on the Food Network television show Chopped. He leaves two daughters and a son, and his funeral took place on Saturday. According to the CDC, just under 70,000 people who helped during 9/11 have applied for medical aid after the disaster, as have about 14,300 people who were in New York City at the time. Among the main illnesses treated are chronic coughs, asthma, cancers and depression. In January 2011, the Zadroga Act – named after a police officer who died of a lung disease – was signed into law, authorising a fund for monitoring, treatment and compensation for 9/11 survivors. So far, close to $3.3bn has been paid out. New York’s Committee for Occupational Safety & Health says that about 6,000 of the 9/11 first responders are now living with cancer, with thousands more suffering breathing problems or mental health issues. Many, it said, had “suffered severe exposure to numerous WTC-derived contaminants”. Gerard Fitzgerald, of the firefighters’ union the UFANYC, told the BBC that of the 10,000 active firefighters and 6,000 retirees who attended Ground Zero on or after 9/11, about 2,000 had gone on to suffer some form of cancer. He fears the alarming rate of cancer cases among New York firefighters could soon increase substantially. It’s feared that 9/11 first responders were exposed to significant amounts of asbestos, but cancers caused by asbestos exposure rarely emerge until 15 years later. “We are living proof of the 9/11 effects, of that toxic soup we were breathing in,” said Mr Fitzgerald, who arrived in Manhattan just after the second tower fell, before staying for 40 more hours.